The sole change from the 1998 representative uniform was the return to three stripes at the top of the socks. It remains unknown if the Western Australians continued to wear their black uniform or returned to their gold uniform with black swan for this match. Please contact me if you can help. A return to the classic Western Australian gold jumper with a black swan front and centre, previously worn in various incarnations 1935-57 and 1988-93. - the swan was a new solid black design (earlier versions featured an orange beak, various feather outlines, etc.). - return of the front numbers (previously worn 1977-93). - new version of the Belt Up sponsor patch first worn in 1997. - sponsor patch (Carlton Draught) on the rear of the jumper for the first time. - in addition to these front and back sponsorships the WA State team was renamed the "Carlton Draught Black Swans". - the breast of the jumper now included the name of the league (WAFL) and the year of the match. - stripes at the top of the sock changed from three to two. The design of the 2004-2005 uniforms is known (gold with a black swan) but the various sponsor patches on the jumper are not. Please contact me if you have any photos of this uniform. - the modern-style jumper designed to be worn untucked and with baggy shorts. 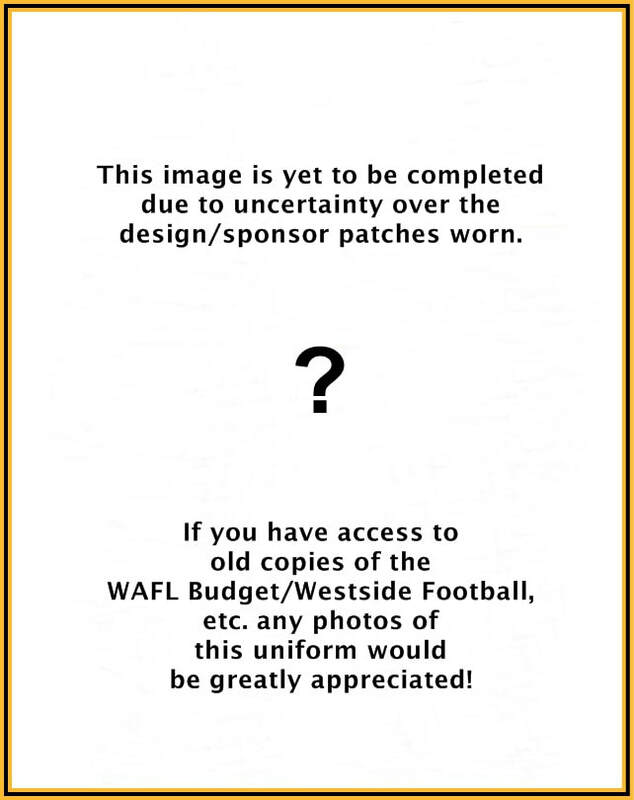 - new sponsor patch (AAMI) located where the 'WAFL 200X' had been previously. - WAFL shield added to the shorts. - new Carlton Draught sponsor patch replaced the former Carlton Midstrength patch. - gold neck bar added to the base of the v-neck. - the league name and year of the match returned (WAFL 2007). - new lower-case version of the Belt Up sponsor patch. - the rear sponsor patch was modified (text was made smaller and the "Carlton Clydesdales" were added to the centre of the patch). - WAFL shield dropped from the shorts. - gold trim on the front and rear edge of the shorts became thicker (similar to the 1980-81 shorts). - the front numbers were changed from the Amercian football-style font used since 1977 to a traditional footy font. - the Carlton Draught front patch changed from a square to an oval. - neck bar was changed to black. - the WAFL shield returned to the shorts. - the neck bar was dropped in favour of a new "cut-off" style of v-neck. - a new WAFL shield at the neck featuring the AAMI logo above it. - the AAMI sponsor patch returned, replacing the "Belt up" patch. - Carlton Draught patch returned to the square version first seen in 2007. - this Carlton Draught logo was also added to the shorts for the first time. - the WAFL shield was again dropped from the shorts. - the rear Carlton Draught logo was again modified, with the Carlton Clydesdales moving from the centre to the left of the patch. 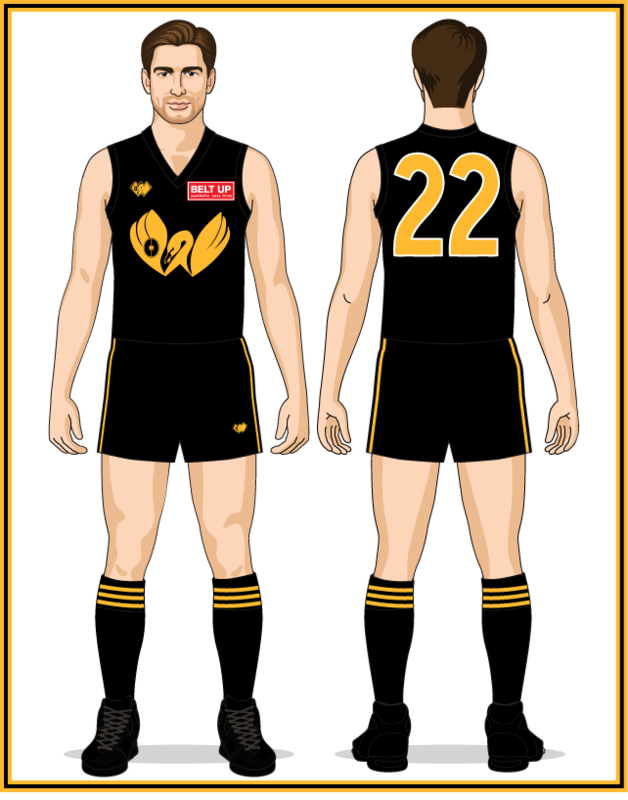 - the Carlton Draught patch on the jumper front changed from a square to a rectangle with a white background. - a jock tag was added to the base of the jumper front featuring the WAFL shield and the Sekem logo. 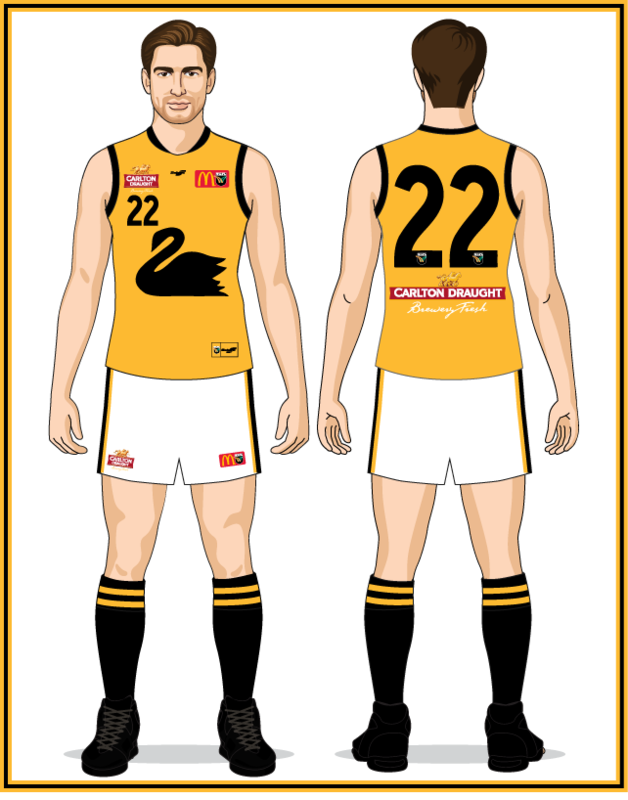 - a fourth version of the Carlton Draught patch was added to the jumper front, this one including the words "Brewery Fresh". - the shorts patch was also updated from the square logo to this modern version. 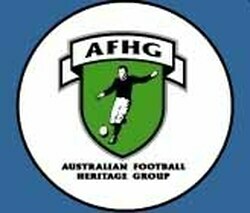 - the WAFL-AAMI shield moved from the base of the neck to a larger version that replaced the AAMI logo and "WAFL 2012". - the jock tag changed from white to gold. 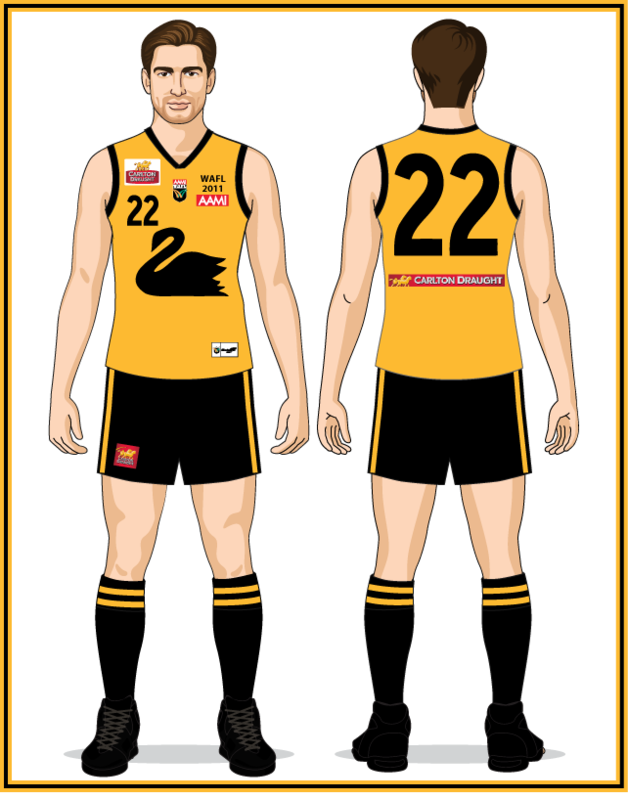 - the WAFL-AAMI shield was added to the shorts. 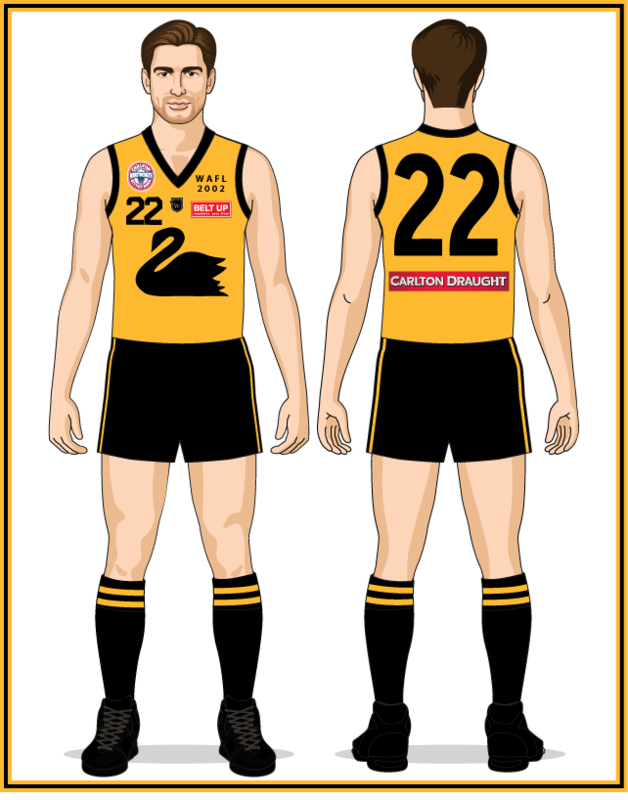 The WAFL-AAMI shield and the Carlton Draught patches were inverted, otherwise the uniform remained unchanged. - a new neck design (changed from a v-neck to a circular style). (this was added to the front and rear of the jumper as well as to the shorts). - new WAFL-McDonald's logo (this replaced the WAFL-AAMI shield). - the logo of new sponsor Redimed was added to the jumper front and rear. - the WAFL shield was added to the base of the numbers. - no Redimed logos front or back. - Sekem logo added to the base of the neck. - white shorts worn for the first time since 1998.